LONDON The man who admitted to journalists that he drew on a mural by American painter Mark Rothko at London's Tate Modern museum was taken into custody on Monday by British police. Scotland Yard launched its investigation after the mural, one of Rothko's Seagram series, was defaced Sunday with what appears to be the words "Vladimir" and "a potential piece of yellowism." Tim Wright, an eyewitness, tweeted "This guy calmly walked up, took out a marker pen and tagged it. Surreal," and included a picture of the graffiti. Calling the incident bizarre, he said the suspect sat in front of the paining for a while before springing to action, then he quickly left the area. Vladimir Umanets, who identifies himself as the co-founder an artistic movement he calls "Yellowism," told journalists he was behind the graffiti. According to an online manifesto, Yellowism is an artistic movement run by Umanets and another person, Marcin Lodyga. Earlier Monday Umanets told Britain's Press Association news agency that he wanted to draw people's attention to his movement, which he described as "an element of contemporary visual culture." "The main difference between Yellowism and art is that in art you have got freedom of interpretation. In Yellowism you don't have freedom of interpretation, everything is about Yellowism, that's it," he said. The police statement, released late Monday, didn't give a name, but when asked about Umanets, a police spokesman said that a 26-year-old man had been arrested in the coastal town of Worthing, about 60 miles south of London. Police in Britain generally use that formula to indirectly identify suspects. Umanets told Press Association he expected to be arrested, but said he believes his scrawl increased the painting's value. "I believe what I am doing, and I want people to start talking about this. It was like a platform," he said. "I didn't decrease the value, I didn't destroy this picture, I put something new." Rothko, who died in 1970, is renowned for his large abstract paintings featuring bold blocks of color. The defaced painting was one of a series intended to decorate the Four Seasons restaurant in New York. Rothko changed his mind about the commission and gave the works to galleries, including the Tate. The artist's children, Kate Rothko Prizel and Christopher Rothko, said in a statement that they were "greatly troubled" by the incident, but confident the Tate would do everything it could to remedy the situation. 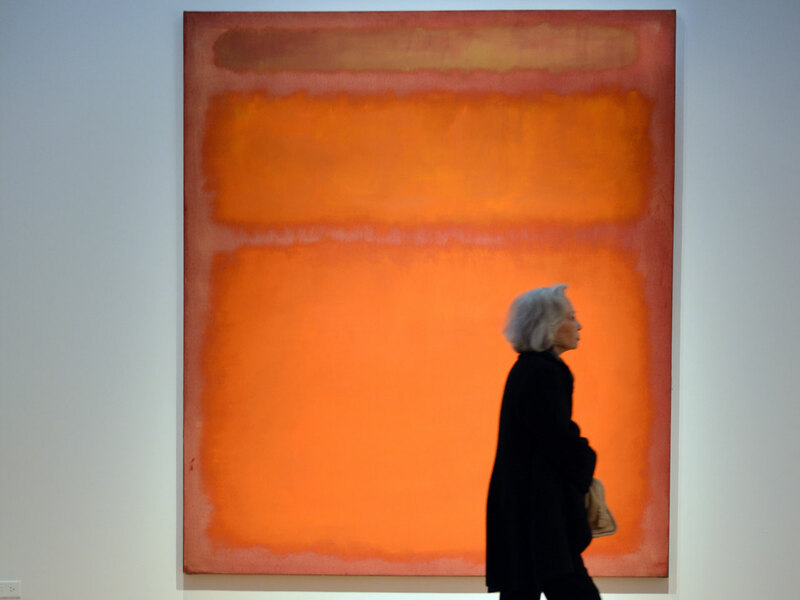 While the Tate Modern has said it does not have a price for the defaced piece, another Rothko piece -- "Orange, Red, Yellow" -- sold for almost $87 million at auction in New York. This is not the first time an artwork at Tate Modern has been interfered with. In 2000, two Chinese performance artists attempted to urinate on Marcel Duchamp's urinal sculpture "Fountain."